The year is almost over and I thought it would be fun to do a fail and fun blogpost. I’ve also been blogger for a year now and I’ve learned a lot. I’ve failed. In life, in blogging, in trying. But I’ve also had lots of fun moment with trying, blogging and life. so I though I’ll make a little list of things in which I failed and had fun with. I bought a phone last year around February. After trying it out I found out it was a horrible phone because my hand was to small for it. And I just couldn’t deal with it, in the end I thought it was ugly. The next day I brought it back and went back to my old school, 5 year old Samsung galaxy ace. But it’s just the big fail that I finally bought a phone and then hate it! But I’m so glad that I returned that phone... My new years resolution is to buy a new phone. One I truly like. Not only because of the price. Another fail is to post on every Monday. I’ve already told this in another blogpost. But man.. this is so hard. I keep making promises and I break them 99% of the time. And then I disappoint you and myself. I really try, but I just keep failing at this. I hope and really going to try to make this better in 2016. The November Instagram Challenge. This is I guess my biggest fail. But it has story. I started and had everything written down in my diary because I knew I would forget to post. The first 5 days went very well and proudly I posted that I was doing well. Literally the next two days I forgot to post. Then I posted 2 or 3 days and got bad internship news. My world was shaking and I had so much stress the week after that, I completely forgot everything around me because I had to decide what to do. Go on with my internship or stop. In the end I didn't stop and choose for the online internship and not the newspaper and that was a really good discision. But after that, I never picked the challenge up again. So there is now barely a week of the challenge on my Instagram. How embarrassing. This year traveling has been crazy. I’ve never visited so many city’s ever in a year. Thanks to school I got to visit Brussels and London. 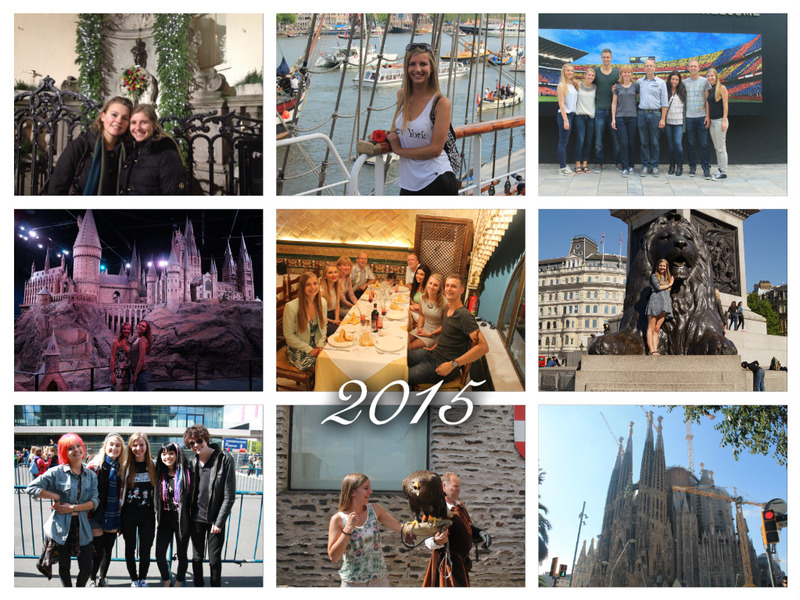 And thanks to my parents we went to Luxembourg and Barcelona. Crazy crazy crazy but very fun days which I look back at with the biggest smile on my face. And I hope I'll get new chances to travel soon! The concerts are also highlights of this year. I've waiting almost a year to see 5SOS live. and then it finally happened. Soon after that I had the chance to see Hey Violet live and it was just amazing. I love going to concerts! ,Oh and next year I’m going to see 5sos again!! The blogging. It’s just amazing to blog. When I’ve got free time I’m always thinking about this. What can I do next? What should I still be doing? It’s always on my mind and it’s a good thing to have on my mind. It's just my way to spend time on my lonely attic in Ede. This is now hobby of mine. No, I'm not on a dating site. But this has to do with Lexa.nl, a dating site in Holland. I had to do streetinterviews for the newspaper. I had to wait in the middle of a busy street for the photographer to come. So I stood there with my phone waiting for him to call. Suddenly a man, around 40 years old, walks over to me and asks me: 'Are you from Lexa?' At first I didn't realise what he was saying. So I just said no. Later I realised that that 40 year old man was thinking that I was his date... HI-LA-RI-OUS!! I could make both lists a lot longer. But I choose these because these were the first moments I thought off which made me laugh and/or cry this year. But there are much more moments that I'll never forget that happened this year. Because this year was amazing. I learned a lot. And with a lot I mean a LOT. Seriously, this year was eye opening for me. I've cried and laughed and became a stronger girl. And I hope for all of you that this year was also an awesome year. I wish you all the best for 2016. I hope next year is filled with lots of love, fun, laughter, family, friends and new perfect moments to remember for the rest of your life. Stay save on new years eve (if you're aloud to shoot fireworks into the sky) and I'll see you next year!! 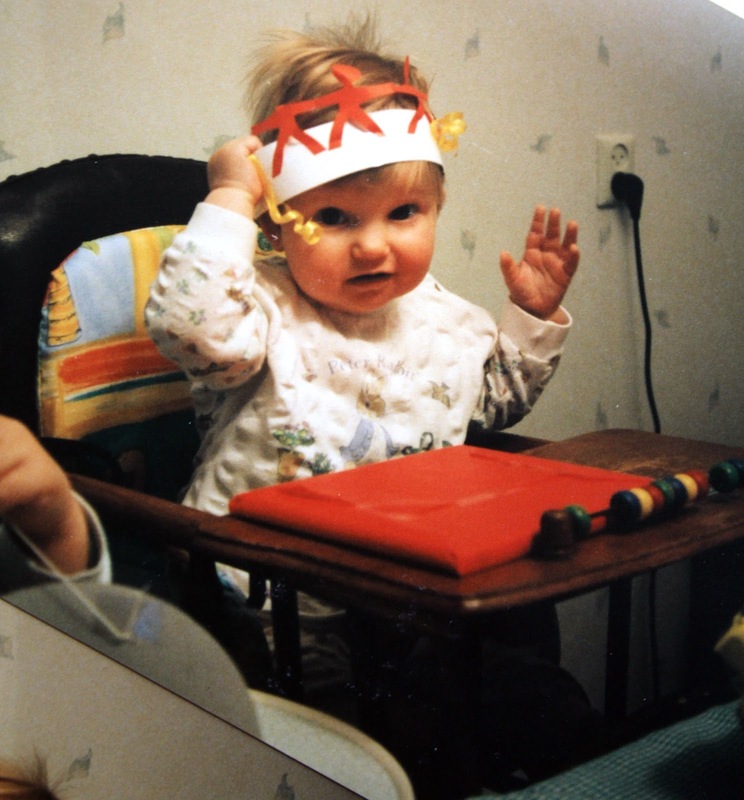 Today my blog turns one! How crazy is this? My first blogpost is an under construction blogpost. I’m not quite proud of that but hey, I had to post something because my blog was changing every 3 seconds because I was trying out things. I thought it would be very confusing to someone that is visiting my blog and everyday it looks different because I changed colour, header, font. Just everything you can change I changed the first week. Even for me it was sometimes confusing. One day I had changed settings and I was happy with it. The other day I saw my blog and was like: what was I thinking yesterday?? But that post was not my very first post. I’ve had a blog with two friends before this blog. We had big plans and February 2014 we got the blog online. The deal was: before my 17th birthday and we made it! I was so proud of it and I kept coming with ideas and stuff. But as the time flew by and the new school year was coming both my friends dropped out of the blog. So I decided to start my own blog. I got all my blogposts of that blog and rewrote them and posted them on here. So the first two month’s I could post a lot. It was quite good to have a buffer like that! But for next year I’ve got some amazing plans. I’ve already planned new blogposts, got a little new idea and hope it’s going to work out. And I hope that after January, when I have finished my internship, things will be a little bit less busy. I hope everyone has loved the journey so far and I hope you still keep visiting my blog because even though I didn’t post every Monday I have enjoyed everything and loved writing and sharing about my life experiences. Again, I hope you enjoyed this just as much as I did. And I enjoy it a LOT! Hope you'll visit me for another few years!! We all know Santa right? Do you also know Sinterklaas? No? Well, get yourself a cup of tea, take a seat and learn from this history about the Dutch children’s friend. So I’m going to try to explain to you guys what Sinterklaas is... Here is my attempt. 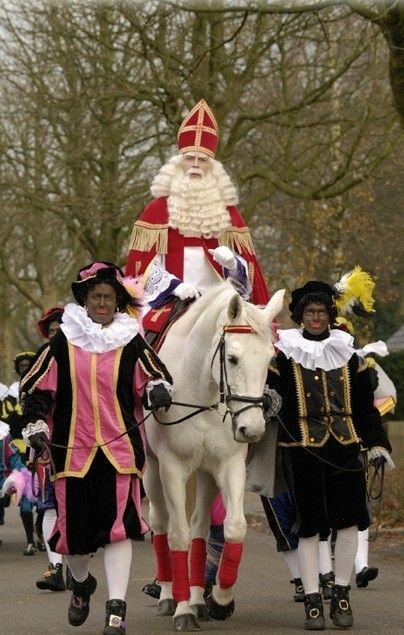 Sinterklaas looks a lot like Santa. He also has a beard but longer than Santa. Santa has elves that help him and Sinterklaas has helpers we call: pieten. (The last 4 or 5 years there’s a huge discussion if the way the pieten looks like are racist or not because we paint our face black and wear wigs and funny sort of satin looking outfit… As a child I never thought it was racist, and I still don’t think this children’s event is based on racist thoughts but other people feel discriminated which I also understand. 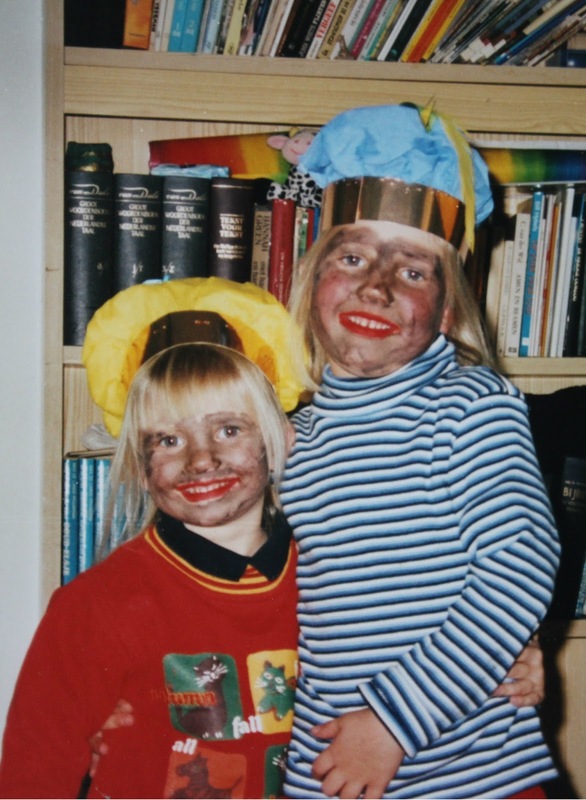 To make it clear, I’ve never compared zwarte piet to someone with a darker skin colour. And I really understand that it hurts people who have (had) to deal with racism due to zwarte piet: translation: black piet. So I’m also okay with coloured faces they introduced one or two years ago than only black faces to stop the racism. My biggest problem with this discussion is that it's completely getting out of hand. Grown-ups (black and white) are literally yelling at each other without listening and saying the worst things to each other... The tradition mood has changed from everything happy to a heated never ending discussion.) But I don’t feel like discussing the racist-or-not-part. But I had to tell this because this is a major thing in here in Holland. I just want to talk about the happiness it brought me as a little girl. 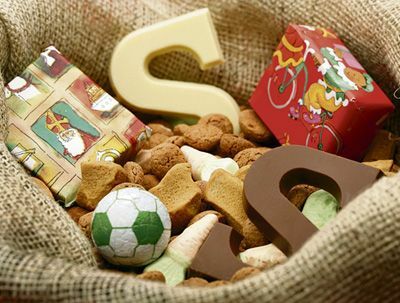 Chocolate letters, pepernoten, kruidnoten, schuimpjes and of course presents! 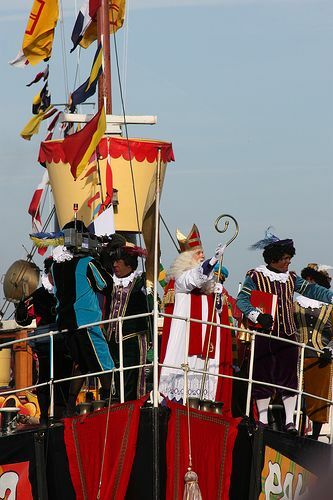 Once a year an old man comes from Spain on his boat to the Netherlands to celebrate his birthday on December 5th. And no one knows how old he exactly is... The old man has very funny and sweet helpers: (zwarte) pieten. A whole year Sinterklaas and his pieten are preparing for the best three weeks in the Netherlands. November 14th this year he had arrived on the boat full of candy: pepernoten, kruidnoten, taaitaai poppen and chocolate letters and of course presents for all of us! Then we had to sing a song to Sinterklaas and the pieten to let them know we set our shoe and show them that we've been a sweet boy or girl this year and really would love to get some present in our shoe!! Then the next morning the shoe is filled with a present or/and some candy. The whole evening is about food, family and presents and it’s like the best thing that ever happened to me when I was a little girl. The whole day I was excited and wanted to know when Sinterklaas would come and bring us presents. But you never know when he’s coming because Sinterklaas has to go to every boy and girl in the country. Sinterklaas also has a big red book. In that book is written all the good and the bad things you did that year and how much presents you get. (That’s just bullsh*t, it’s only to keep us, little jumping pumped up kids grounded J ) I was always a bit scared of Sinterklaas. He was so beautifully dressed and he just looks very impressing. Piet has always been my favourite because he gives me candy and is always funny. I still love this time of the year. Even though I’m older now and know the secret of this children’s day and the discussion. Now we mostly buy presents for each other. Something like secret Santa but different. And we have a nice dinner together. But I think the moment that we’re all together and have fun is the best part of Sinterklaas nowadays. I know Sinterklaas looks a lot like Christmas but as a proud dutchy I can say that the tradition of Sinterklaas is older than the story of Father Christmas. (Although I also love love love Christmas, we don't celebrate it with presents.) We have Sinterklaas on December 5th. So, now you’ve learned a little bit about our awesome tradition. I hoped you liked it and found it interesting! sooo, the winner of my very first giveaway is…. Congrats girl!! I hope you love the clothes just as much as I do. Also, I emailed you so get back to me ASAP to give me your details so I can sent the clothes to you as soon as possible!